Every year hundreds of thousands of people descend on Montreal for Fierté Montréal Pride (August 9 – 19, 2018). Montreal is known for throwing one of the largest LGBTQ Pride celebrations in Canada (if not largest, depending who you ask) and is a must see and do on anyone’s summer calendar. This year hundreds of thousands of partygoers are expected to attend more than 150 events – including free outdoor concerts, literary readings, theatre performances and great parties – during the 11-day-long festival. Now, we know not everyone can hit all eleven days, so we have rounded up some of our favourite events, activities and attractions to help you make it the best long weekend in Montréal. It’s worth taking off your Friday from work and heading to Montreal Pride Thursday night for Drag Superstars. This annual event keeps getting bigger and bigger each year. Bianca Del Rio, winner of the sixth season of Rupaul’s Drag Race, will host this three-hour show that will bring together a record number of drags from different seasons of the famous reality TV and from around the world. Friday is a busy day of events that starts off with a full Pride Day at LaRonde Amusement Park, where you can ride the rides and catch a great drag performance in the afternoon. If you prefer a day to chill, this would be the perfect day to hit up the shops in Old Montreal, or along Sainte-Catherine W ( a stop in at Simons is a practically a Montreal requirement) or even the hipster-haven called Mile End. As evening rolls in, why not take in a great film, Miss Major – The Movie, The Meeting, The Life, at the Musée des beaux-arts de Montréal for free on Friday night (7pm showtime). MAJOR! explores the life and campaigns of Miss Major Griffin-Gracy, a formerly incarcerated Black transgender elder and activist who has been fighting for the rights of trans women of colour for over 40 years. If literature if more up your alley, be sure to catch Authors in Undies at bar Le Cocktail at 6pm to listen to authors read from their latest works stripped down to their unmentionables. Of course it’s not a Friday night with a few parties and some dancing for everyone and every taste. You can party with bears at Bear Trap (Hangar 500, 10pm) or if electro glam punk rock is more your jam, head over to Parc Des Faubourgs to listen to DJ Frigid and Canada’s own Peaches. But if you are ready to escape the Montreal village and hit up a local party, head up Saint Laurent to Belmont where they host MPU (Mecs Plus Ultra). 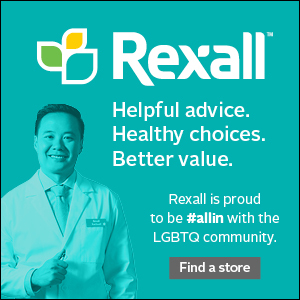 Saturday has always been Community Day at Pride Montreal. 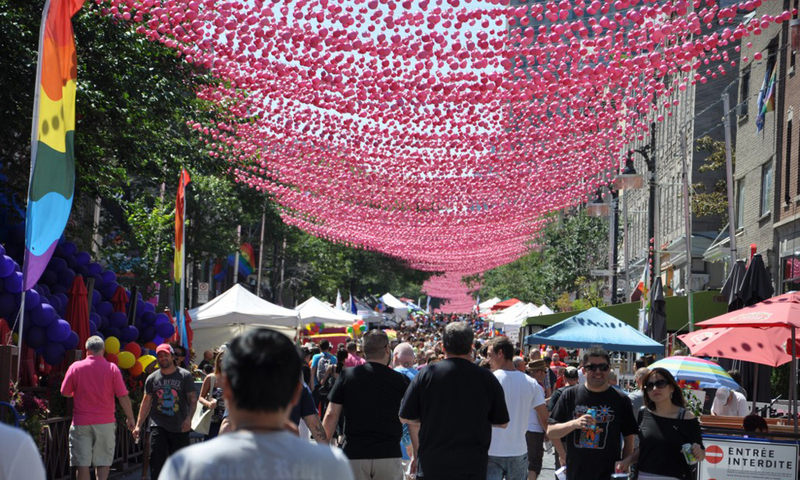 Wander along Rue Sainte-Catherine East to discover the many exciting organizations, community groups, businesses and sports teams, run by and/or catering to the LGBTQ+ community. As you wander the village, you can easily grab a drink or bite to eat at any one of the many ‘expanded’ patios that take over the street during summer. Try out Le Passé Composé for a great brunch or grab some cocktails and nibbles at Renard. And if you must get your poutine fix, Le Resto du Village is the place to go (it’s also great to fill those after the bar cravings at 3am). 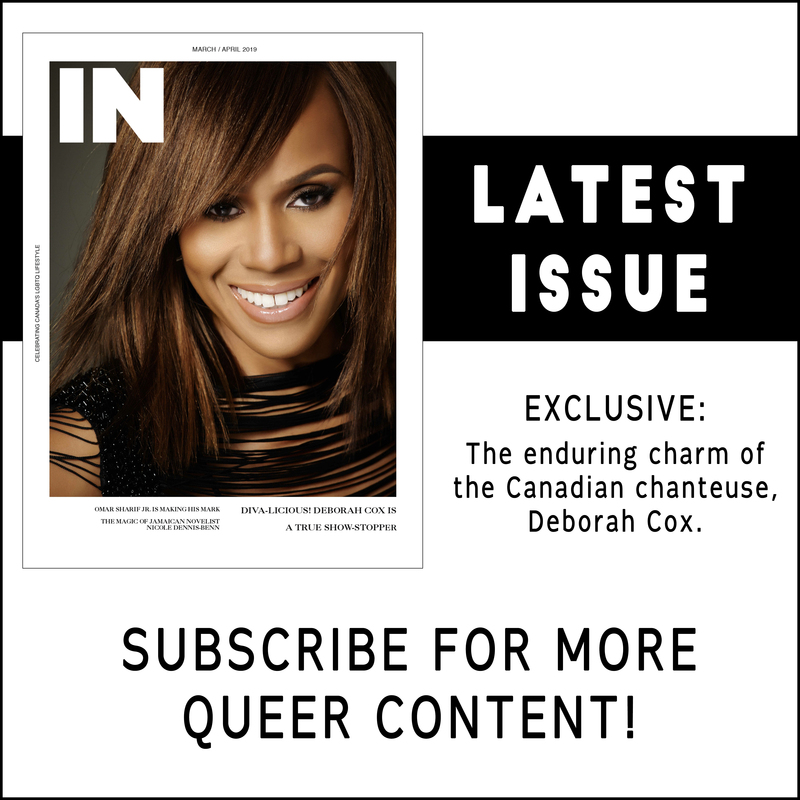 On Saturday night they turn up the volume on the main stage (Parc des Faubourgs) with performances by Deborah Cox, Mia Martina, Callum Scott and Todrick Hall. If you want to head offsite, you can hit up the District Party where a quartet of International DJs will have you dancing ‘til morning. Or hit up Montreal HER Pride Party at Club Soda with headliner Nina Sky. Every Sunday Morning should start with a great brunch, may we suggest you check out Tommy Café, Olive et Gourmando or Le Cartet in Old Montreal. Or If you are staying close to the village, hit up Palme for a Carribean twist on brunch. And if you are willing to make the journey (trust us, it’s worth it), Sparrow is the hot new joint in Mile-End. The Sunday at the end of pride always starts off at 1pm with the Pride Parade along Boul. René-Lévesque, so be sure to grab your spot early to get a good view of all the floats and performances. And it isn’t a Sunday in Montreal without a T-Dance, but for pride the city makes it even bigger with their Mega T-Dance (3pm-10:30pm) in Parc des Faubourgs. Dance your cares away to the beats from international DJs like Suri, Morabito and Hex Hector! Of course there is so much going on during Fierté Montréal Pride that there is no way we can cover it all. But if you want to know more about all that is going on during this eleven day celebration (August 9 – 19) , head over to www.fiertemontrealpride.com for the full schedule.